Nothing tops those kind-of-delicious conversation hearts for Valentine's Day candy. They're perfect fodder for middle schoolers to dig too deep into a "be mine" message and for triggering waves of nostalgia in adults. Even though the original and beloved Sweethearts won't be on shelves this year, they still remain a favorite around the country, according to new data from CandyStore.com. The candy retailer has once again culled data from 11 years of Valentine's candy sales across the nation to highlight the most beloved Valentine's Day candy in every US state. (At least, the most beloved based on sales figures.) As was the case last year, conversation hearts are tops in the most states. In fact, the chalky candy grew its stranglehold on Cupid's holiday. (Conversation hearts were number one last year, as well.) Though, that information isn't particularly useful if you're using the data to decide what to buy your valentine. 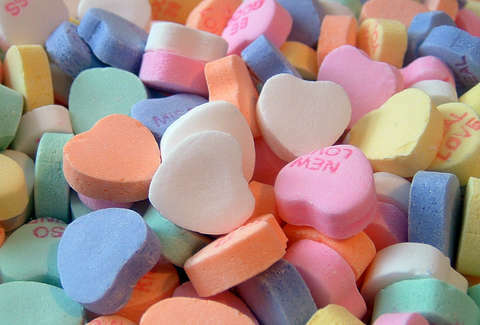 Due to Necco going out of business, Sweethearts won't be on shelves in 2019, though there are plans for their return in 2020. For at least one year, you'll need to find another way to call someone "Cutie Pie."